Chitra Durga the power centre of Palegars is one of the toughest forts of Karnataka. 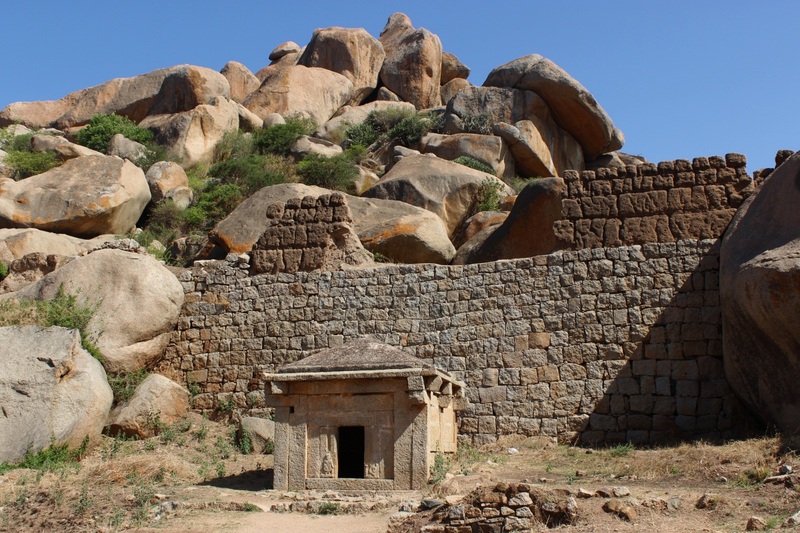 Built over a group of rocky hills, the fort has used natural rock formations to a create formidable defence lines. 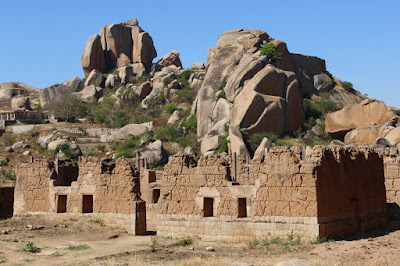 These ruins of a stone-mud walled structures is said to be the administrative centre of Chitradurga fort during the rule of Palegars. Within the admin centre were Darbar Hall and Treasury / Mint. These mud walls have been standing for almost more or less 500 years. Integrated into these walls are wooden columns which probably held wooden beams of the building's roof. Even the wood of those times has preserved itself well. A signage about these ruins has some interesting information. This building uses one of the most popular construction materials - mud. Mud is popular because its is easy to work with, cheap and easily available. And most important, buildings made of it are strong and stay cool during summers. Many houses in this region are still built of mud, using age-old techniques. Preparing mud for construction is making dough for rotis - take soil, add water and knead it by stamping on it. You can add broken pottery (like in walls here), straw or even jaggery to reduce shrinkage and increase strength. When mud is of right consistency, place it directly on the wall base in layers, like here. Or, shape into bricks, dry and then use to build walls. 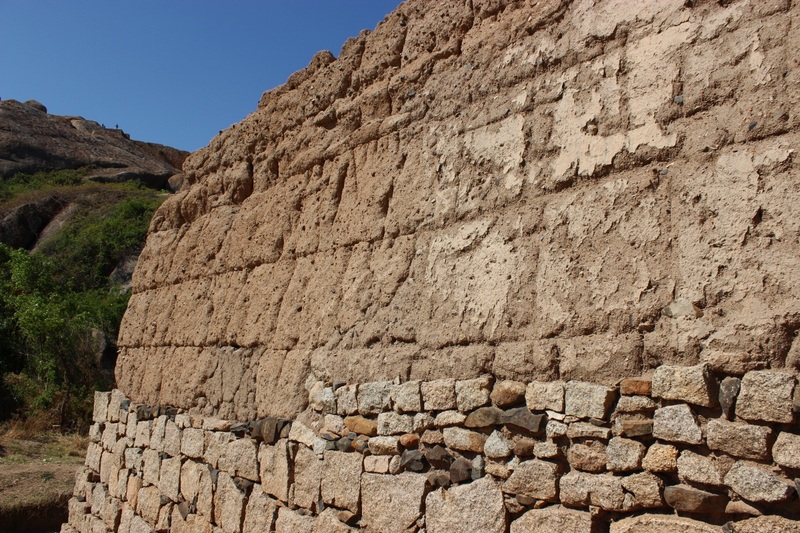 The mint's walls were made by throwing mud between two planks and compacting it. When the layer hardened, the boards were moved along ans the process repeated. The building - once a mint - still stands because it was built to resist water damage. Because the base is most vulnerable to splashing water, these walls have stone plinths. Plastered water channels safely carry rain water from roof to the ground without splashing. The roof probably had large overhangs to prevent splashing. And you can still see traces of the lime plaster further protected the walls from water. A close look at one of the walls.. stone base supports the upper portion. Going by the construction process, we can see this wall has 5 layers here. Remnants of lime plaster can be seen to the right of this picture. Mud wall building and making pottery are closely related. The dirt used in this wall has been carefully selected.. probably from a lake bed. The mud is dried thoroughly, then powdered and sieved to obtain a consistent powder. Then its mixed with water and mixed properly until the entire mass is uniformly consistent. This process is labour intensive, every stage is closely supervised for quality and also security to prevent sabotage. When the mud dries up, it becomes very hard, as hard as stone. It is said that even a crowbar cannot do much damage to these walls. 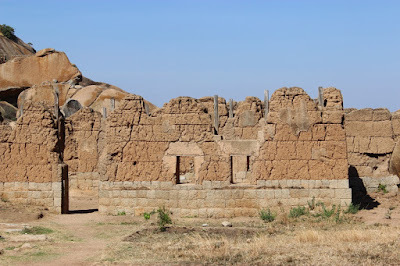 There are examples of forts which have outer walls made of mud as seen here.. Gurmitkal and Chandriki forts are two good examples. 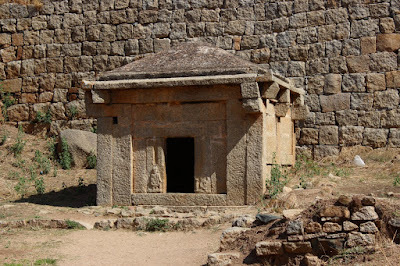 Then there's Laxmeshwar fort.. the walls are 6 to 8 feet thick and upto 30' high.. however not much remains of it now. 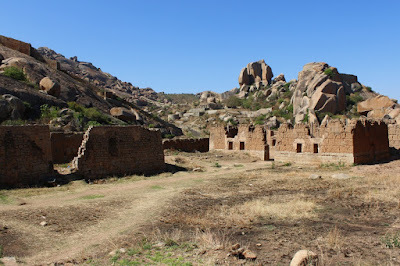 Anvatti fort is one more of the verge of disappearing. I guess once upon a time Karnataka had thousands of mud forts. Coming back to the Chitradurga's administration building, we are looking at this little granite structure with sloped roof. Well, it s not a temple. 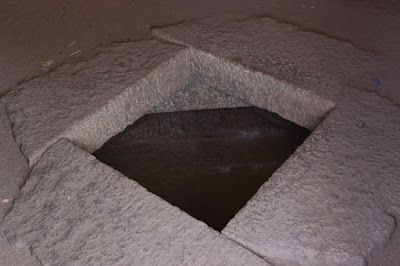 The floor within holds a chamber with a 1.5' square mouth. Locals say this pit was the treasury which held currency of gold and silver. The structure is about 12' x 12' x 14'. Around the base is row of dressed blocks embedded in the ground.. this could be the part of the foundation around the structure to strengthen the ground. The slope roof and the plinth helps rain water to flow away. Basically the structure is designed to be water-proof. Here's the mouth of the pit right in the center of the floor. The pit is lined with dressed granite slabs and packed with mortar.. even the wettest of rainy season would keep this pit dry. Obviously this building would be guarded by dozen or two heavily armed soldiers. No unauthorised person would be allowed to approach it. The knowledge of materials and architecture by our ancestors is amazing. Now we are still not able to decipher it! !